This week’s edition of “See the World” is a very unique destination indeed! Hopefully you enjoyed our journey to George Town, Grand Cayman last week and Fredericton, New Brunswick, Canada the week before. If you missed last year’s “See the USA” series, there are many destinations to explore there. This week we’re heading to the Caribbean and Havana! 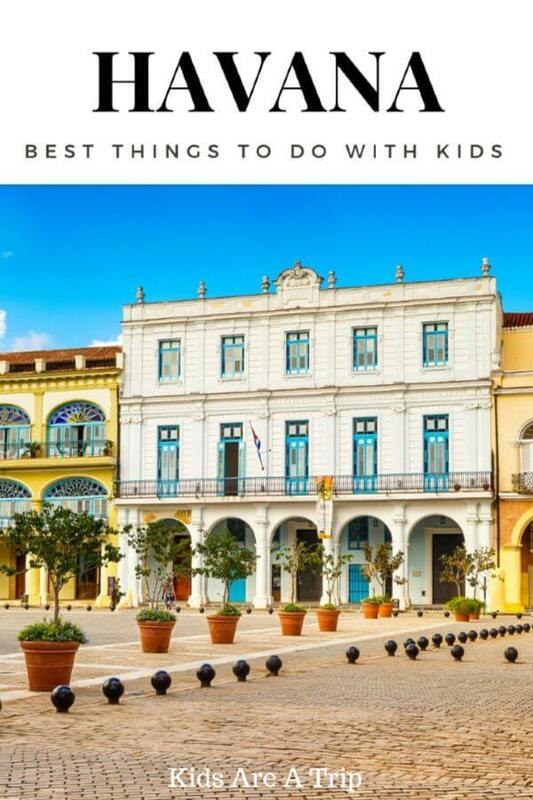 Vera of Hilton Mom Voyage is sharing her favorite family friendly things to do in Havana. This post is filled with practical insight while sharing the best family friendly things to do in Havana. Enjoy! The Cuban capital, once considered the crown jewel of the Caribbean, is a remarkable place to visit. (For current rules on travel to Cuba from the US, start here with the U.S. Department of State). Despite its mostly run down state and continuous struggles under the current regime, the city is intensely beautiful, full of life and one-of-a-kind, infectious energy. It easily ranks as one of the most picturesque places I have ever visited and Cubans are some of the friendliest people I have ever met. While Cuba is generally kid friendly, many things taken for granted at home (diapers, formula, OTC medications, etc.) might be hard to find. Be prepared for “inconveniences” such as sudden loss of electricity, hard-to-obtain internet access, items on restaurant menus not being available, long lines or non-existent customer service. This is part of Cuba. 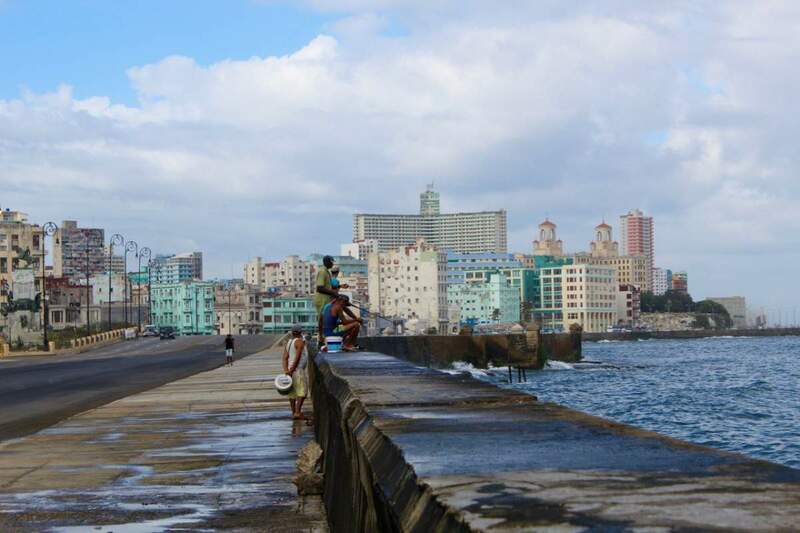 The Malecon is Havana’s famous sea side boulevard which stretches 6 miles from Havana Harbor in Havana Vieja (Old Havana) to the contemporary neighborhood of Vedado. 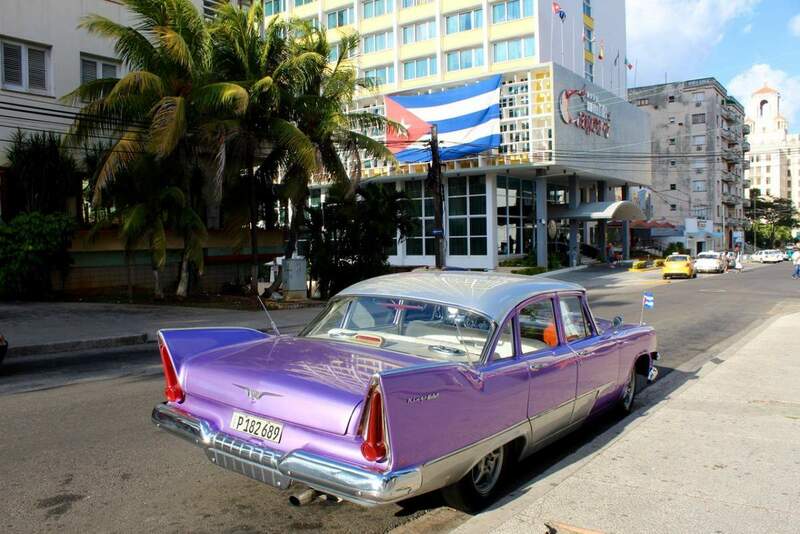 Many refer to it as the soul of Havana. 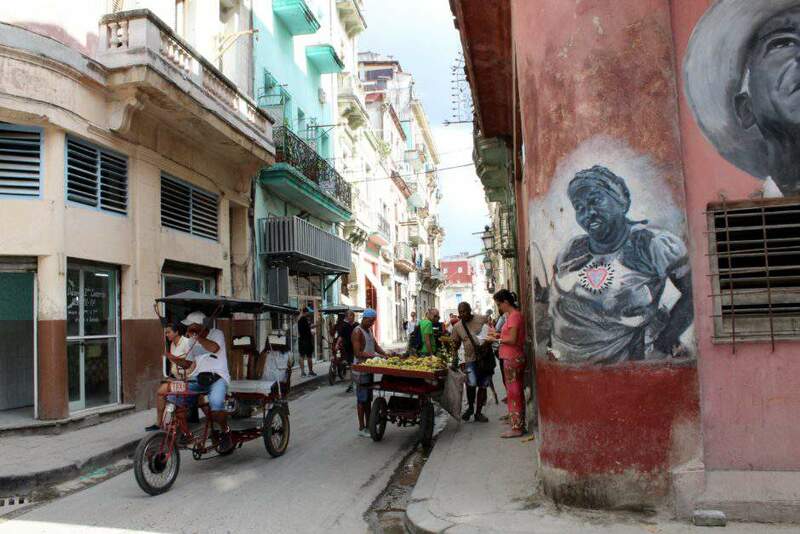 If you are considering a trip to the Cuban Capital, you have likely seen pictures of it. It’s a wide, six-lane road, lined with picturesque colorful buildings on one side and deep blue ocean on the other. Tip: Don’t take the first price offered. Agree on the fare and destination before the start of your ride. For a different and yet another typical Havana experience, head to Havana Vieja, listed as a UNESCO World Heritage Site. You can certainly explore on foot, but a family ride in a horse drawn carriage is more special. This part of the city is filled with gorgeous historic buildings, beautiful churches and picturesque squares, a true colonial gem. 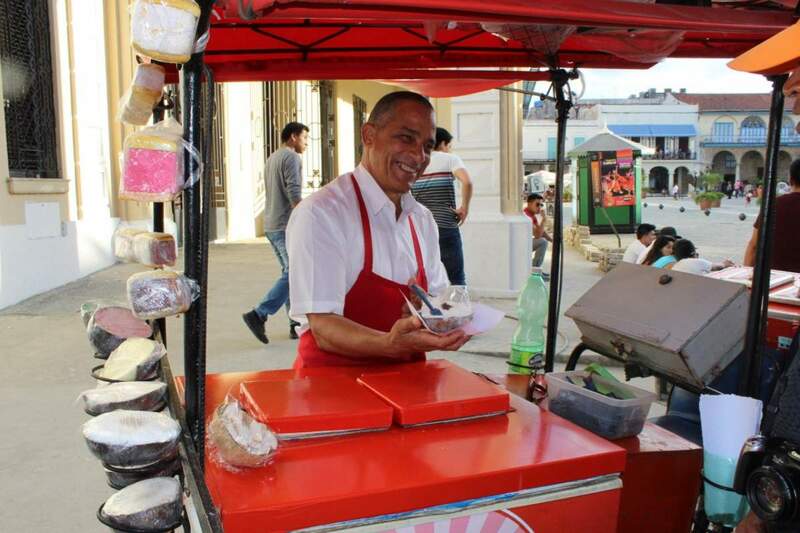 You will also find plenty of unique food options, souvenir and art vendors, bicycle taxis, and kids playing soccer. You will see elderly engaged in a spirited game of dominoes and locals, who are often simply standing in front of their houses in no hurry or with no particular place to be, just observing all the street action. It is easy to lose yourself in Havana Vieja for hours, taking pictures and taking it all in. 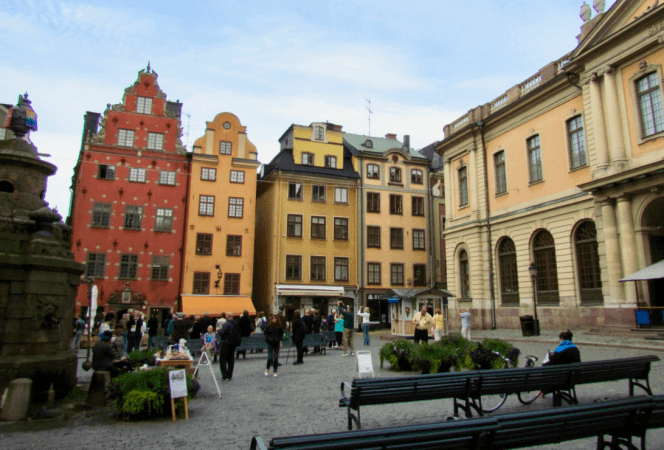 There are plenty of cafes and restaurants waiting for you when you are ready to take a break. Tip: Older kids might appreciate the fact the Ernest Hemingway lived in this part of Havana when he first moved to Cuba. At Hotel Ambos Mundos, you can see his room, complete with one of his typewriters and several fishing rods. Many tourists visit La Bodeguita del Medio, the author’s favorite hang-out when he was not writing. The place is known as the origin of the legendary Cuban mojitos or visit La Floridita, famous for their daiquiris. No worries, there are virgin version for your kids, of course. 1. It is a fascinating sight, known for its unique blend of modern sculptures mixed in with colonial architectural beauty. Teens will love “graming” and finding the meaning of the girl riding a rooster and holding a giant fork. 2. It is the biggest plaza in Havana Vieja. It’s the perfect place for kids to run around chasing pigeons. 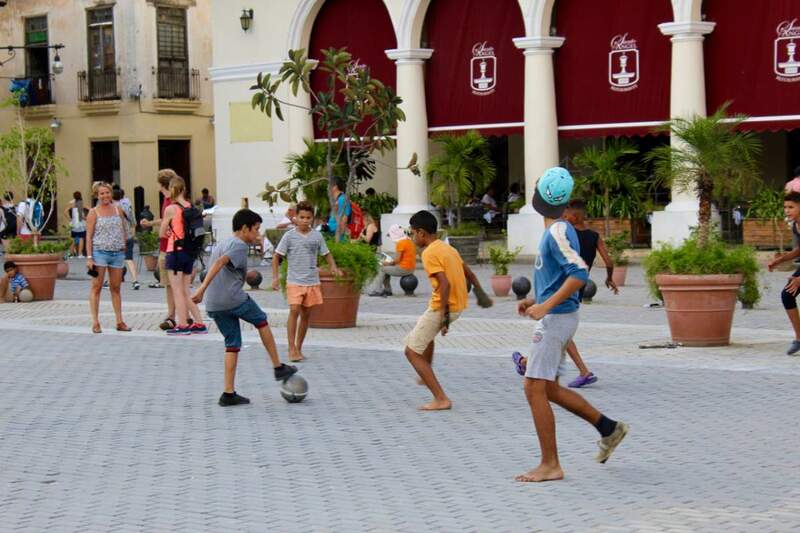 Other children might join in a local youth pick-up soccer game while you enjoy a Café Cubano at one of the restaurants facing the square. 3. The Plaza’s tallest building, Edificio Gómez Vila, offers beautiful 360 views of Old Havana and the harbor. It also houses Cámara Oscura, a unique way to see the city. The camera, which operates on the principles of a periscope, projects images of the city at 30x magnification in a pitch-dark room. There is just enough narration to learn some interesting facts about the city, but not long enough to be a yawner for the kids. 4. This is where you will likely find the street cart with delicious Coco Glace. Made only from three simple ingredients: coconut milk, coconut water and pieces of coconut and served in a half coconut shell topped with just a touch of chocolate syrup. It is a wonderful, refreshing treat after exploring the hot and sometimes sticky streets of Havana. I just mentioned ice-cream, but what kid has ever had too much? 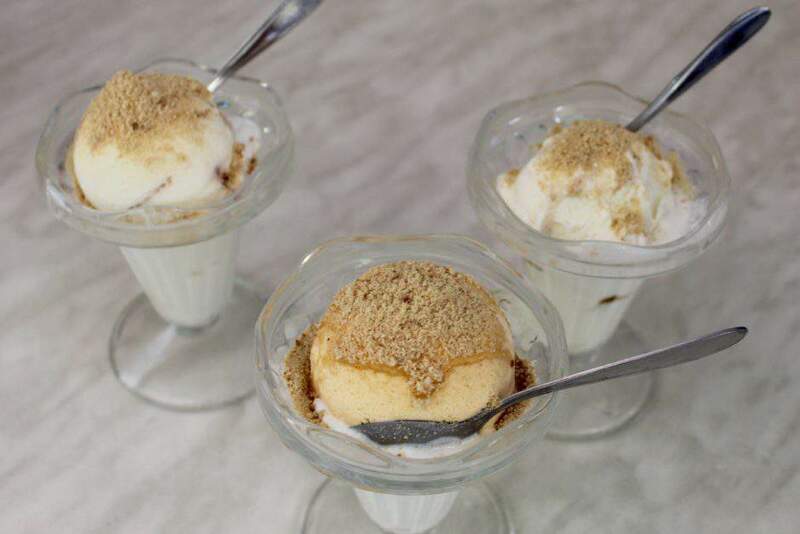 One cannot visit Havana with kids without going to Coppelia’s, Havana’s most famous ice-cream parlor. Located in the Vedado neighborhood, it has been a Havana institution since the 60s. It was founded by Castro himself and named by his secretary after her favorite ballet. It became especially famous after being featured in the film Strawberry and Chocolate. While your kids might not care for all the historical tid-bits, I guarantee they will love the ice-cream. Make sure you go for the “classic combo” which means light caramel sauce and crushed cookies added as toppings to your flavor of choice. Tip: Do not let the insanely long lines deter you. If you are paying with CUC (Cuban convertible pesos, used mostly by tourists), ask one of the attendants and they will direct you to a separate parlor with practically no lines and a small sitting area with tables. Havana’s fort which was built in the 18th century to protect the city, offers beautiful views of Havana, which are most striking at sunset. The fort has a colorful past, which includes serving as a prison of torture for Castro’s government, a fact your kids might find fascinating, depending on their ages and interests. 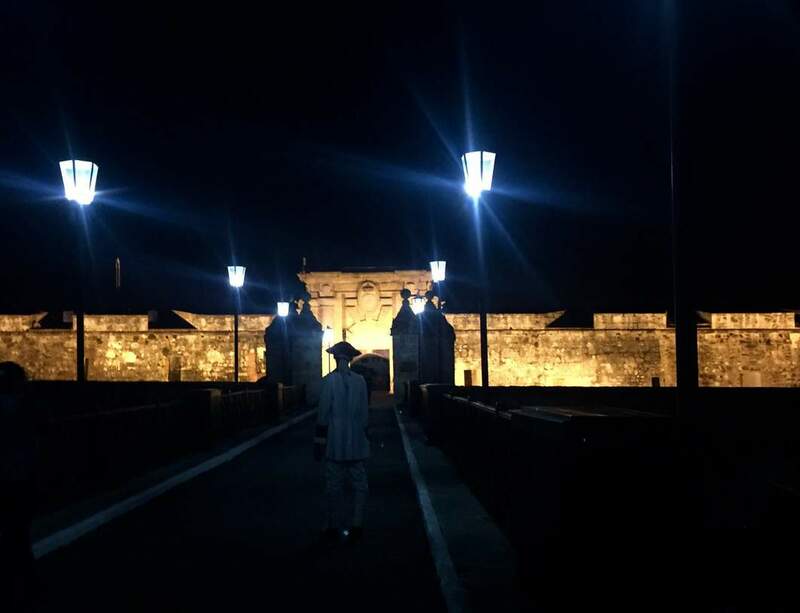 There is a cannon ceremony which takes place on the walls of the fort every night, a custom carried forward from colonial times when it signaled the closing of the city wall gates. It happens after the sun goes down at exactly 9:00 pm, after a brief ceremony. There is also a free museum with exhibits related to the fort and its past which you can visit before or after the ceremony. Tip: Make sure you are on the wall on time or you will miss the whole thing. El cañonazo happens exactly at 9:00 pm and the ceremony is brief (culminating with one very loud boom of the cannon), so make sure you are not counting on “Cuban time”. There are so many other things worth your time and attention in Havana, it is hard to pick just five. Make sure to experience some of the authentic Cuba by renting your room at one of the casas particulares (we had great experience through AirBnB). Eat some fantastic Cuban food such as picadillo or ropa vieja (both very suitable for kids) at one of the paladares, privately owned restaurants. And definitely make sure to learn a few salsa or cha-cha steps. If you happen to be in Havana on a Sunday, a great way to do this is to visit Callejon de Hamel for great outdoor music and dancing. 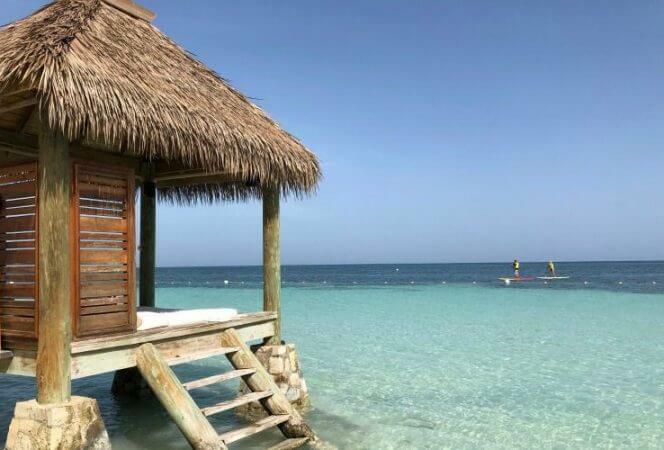 Vera Holroyd is travel blogger at Passports and Spice as well as Hilton Mom Voyage, a blog about real families and their travels. She also writes about travel for other publications and media. 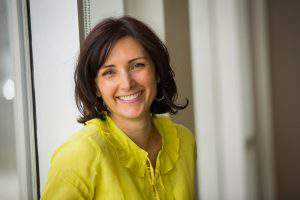 Vera lives in the Chicago suburbs with her family of four and loves being the family travel director. The family likes to wander off the beaten path, seeking unique sights and experiences to make their travels especially memorable. 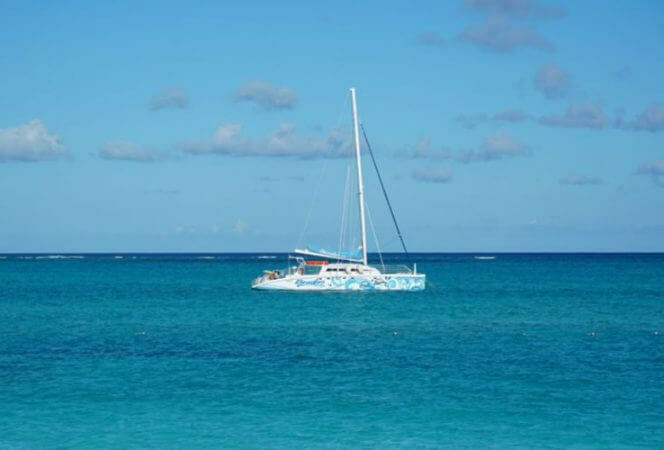 They also enjoy sharing their travel discoveries, tips and wisdom with others.